There’s nothing complicated about this dish. It’s not going to challenge you in any way, but there’s something so delicious about a bit of crusty bread with a tomato squeezed over it that deserves a mention. 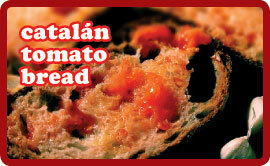 It’s a dish synonymous with the Catalonia region of Spain and is served in every bar and restaurant. Great as a tapas dish or for something late at night before bed time. 6 medium sliced from a French baguette or crusty loaf. Toast the bread on both sides until golden. Rub one side with a half of garlic, drizzle about a teaspoon of oil over the slice then squeeze a tomato half, like a lemon onto each slice. Rub the tomato to form a pulp over the slice then discard the skins. Sprinkle a little salt & pepper and repeat this process with the remaining bread slices. If you’re quite lazy, then you can supply your guests with all the ingredients and have them do it themselves. Makes for a fun opening dish. As a simple tapas on its own, or with a little slice of jamon and a couple of anchovies to tart it up a little.